Specially Processed Swine Food Sparks Global Spamdemic? San Diego, CA – During a conference on Universal Healthcare in San Diego earlier today, Dr. Sterling Hogbien, of the Hogbien Institute and Minute Mart, unveiled the above map. 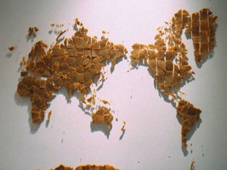 Created from over fifty cans of SPAM, the map is a cryptic warning of things to come. “This is what our planet is going to look like by 2014!” shouted Hogbien to a stunned crowd of healthcare professionals. Among a list of wild assertions, Hogbien insists that Spam is to blame for the current global pandemic. Witnesses report the aged archeologist belted out Monty Python’s Spam song as he was hauled away by hotel security. The Obama Administration has not released any statement on the matter. CEO of the Daily Discord, Pierce Winslow, is calling for a boycott of all Spam related products, “just in case.” When asked about his life-sized Spam sculpture fountain that typically adorns the annual employee picnic, Winslow became highly agitated. He started reciting excerpts of Churchill’s speech and then stapled his tie to his forehead. President Obama has failed to comment on that too.